Shahdag and Spa Hotel is located in the picturesque and calm place in the mountains, 142.9 miles north of Baku. 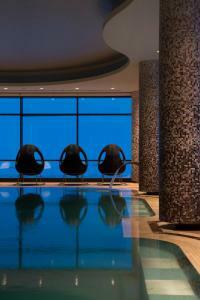 It features a spa area with an indoor swimming pool, a gym, a sauna and a Turkish steam bath. Free Wi-Fi and free parking are provided. 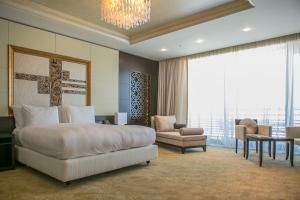 All classic-style rooms come with air conditioning, flat-screen TV, a safety deposit box and a minibar. Free toiletries and a hairdryer are available in the bathroom. The on-site restaurant offers various Azerbaijan and European dishes. 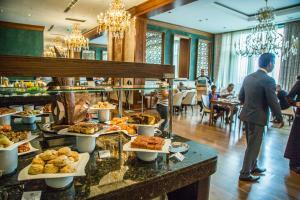 A buffet breakfast is served every morning, and guests can have a drink at the elegant bar. Guests can go cycling, horse riding and hiking. 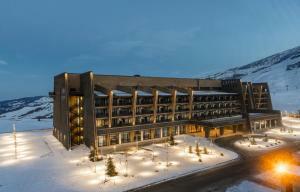 The hotel offers its own skiing school and provides convenient access to the slopes. Also it is possible to order massage services, and there is a children's playground on site. The nearest airport is Heydar Aliyev International Airport, 142.9 miles away.